Outerlands is everything I love in a neighborhood restaurant. The main menu is straightforward -- fresh wholesome food that nourishes and comforts soups, sandwiches and stews. The heirloom tomato soup was well balanced with a strong tomato flavor and spicy tap at the end. A side of grilled cheese was made with thickly cut pieces of crusty bread, crunchy and perfect for dipping into the soup. We also loved the spicy and soothing ginger cider. The food is comforting and matches the beautiful interior of reclaimed wood. 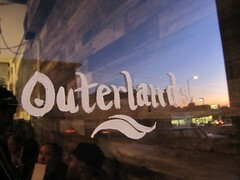 Enjoying a meal at Outerlands feels like taking relaxing trip to a cabin in Big Sur sipping cider and eating hot soup in front of a fireplace. It is that warm atmosphere and friendly service that makes me wish I lived around the corner.